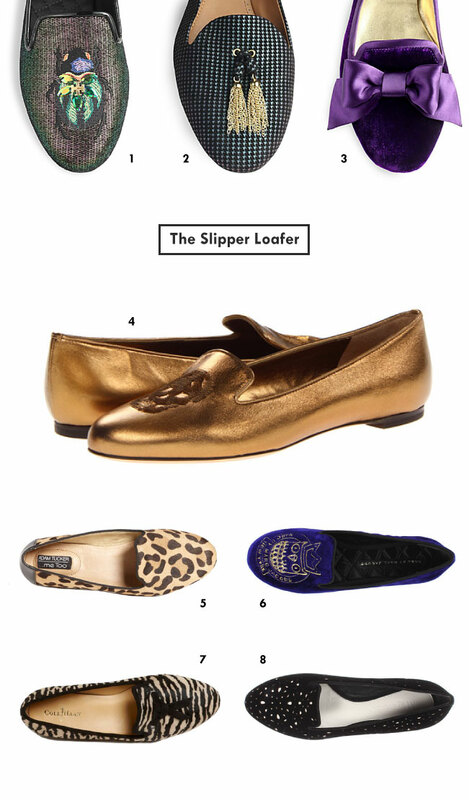 Designers from A to Z are coming out with their version of the slipper loafer. This comfy flat has made its way from the days of the smoking room into modern day millennial fashion.Yes, the ballet flat certainly revolutionized comfortable style not long ago and has held strong through the seasons…but right now, it’s all about the loafer. We’re seeing them adorned with everything from glitter to insects, baubles to bows – it’s pure unadulterated embellishment bliss. Moms, these are for you. Throw them on with a white burnout tee and distressed skinny jean as you bolt out the door for drop-off and your look will be immediately updated and right on-trend. There are so many ways to wear this trend, so please remember it’s not just about dressing them down. Get creative and put it with a skirt and one of this season’s glam sweatshirts. Live on the edge and wear with a menswear chic suit. This shoe is capable of so much more than you think. And did we say how comfortable they are?